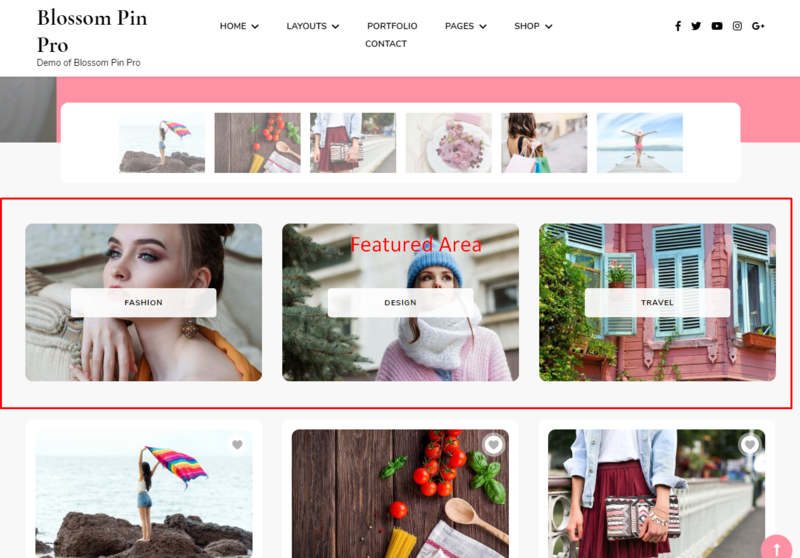 Welcome to the documentation of Blossom Pin Pro theme– A modern masonry layout theme with advanced features for stunning your audience! First of all, thanks for choosing the theme. Our team created it with a lot of hard work and love. 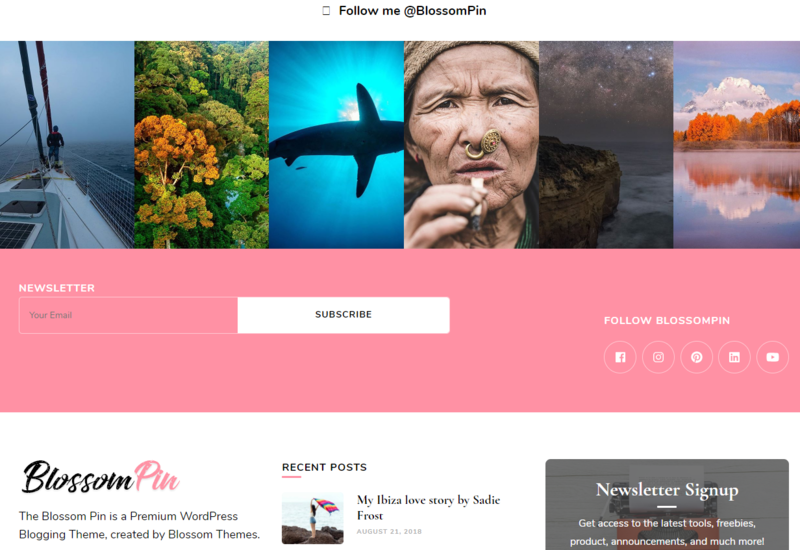 We hope your website is blossoming with Blossom Pin Pro theme. 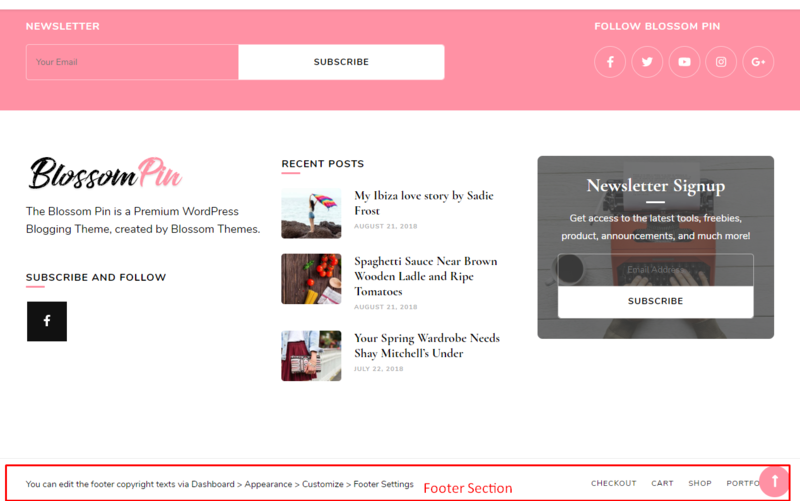 Blossom Pin Pro is a stylist Pinterest-style free WordPress theme with an infinite scroll feature. 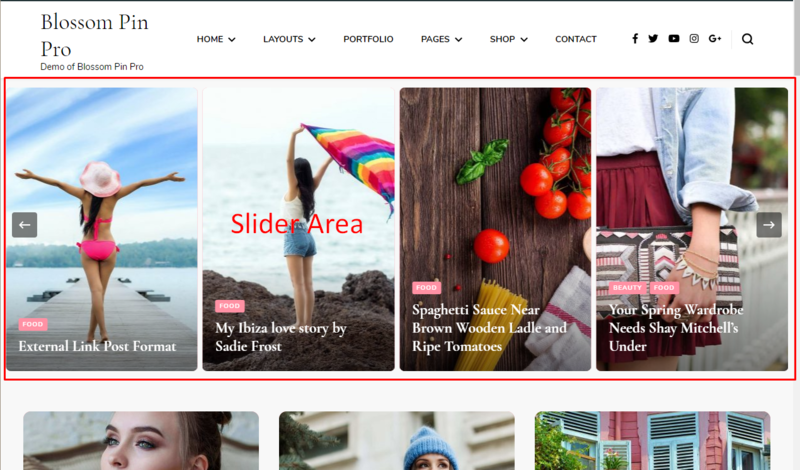 Intuitive grid layout, fully responsive design, SEO optimized with Schema ready code, and easily customizable settings make Blossom Pin Pro one of the most trendy WordPress theme for personal bloggers. 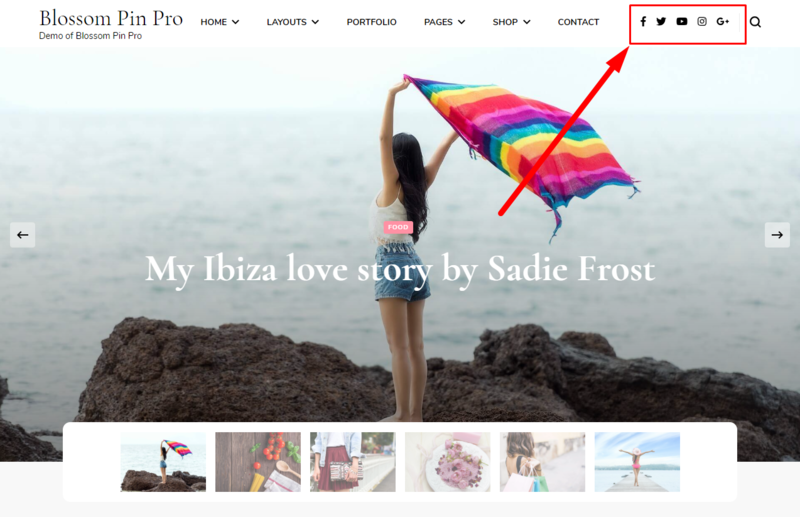 Get started with your personal blog or an online store that your visitors and Google will love without writing a single line of code! 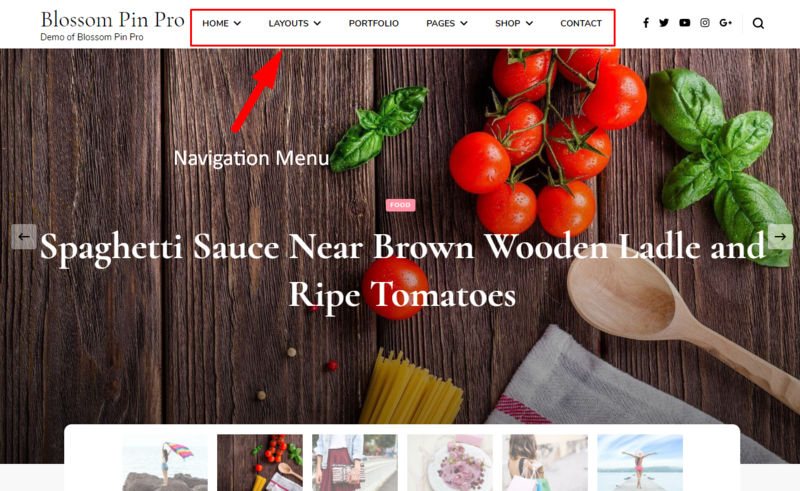 The main goal of the documentation is to provide you with the guidance and walk-through to set up the theme on your website in an easy-to-follow manner, while also introducing you to some of the features of the theme. So, we encourage you to go through this document and keep it handy for reference. 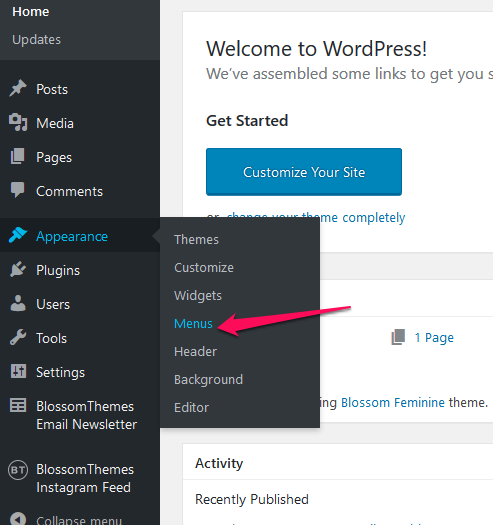 Make sure Blossom Pin Pro is compatible with your WordPress version. 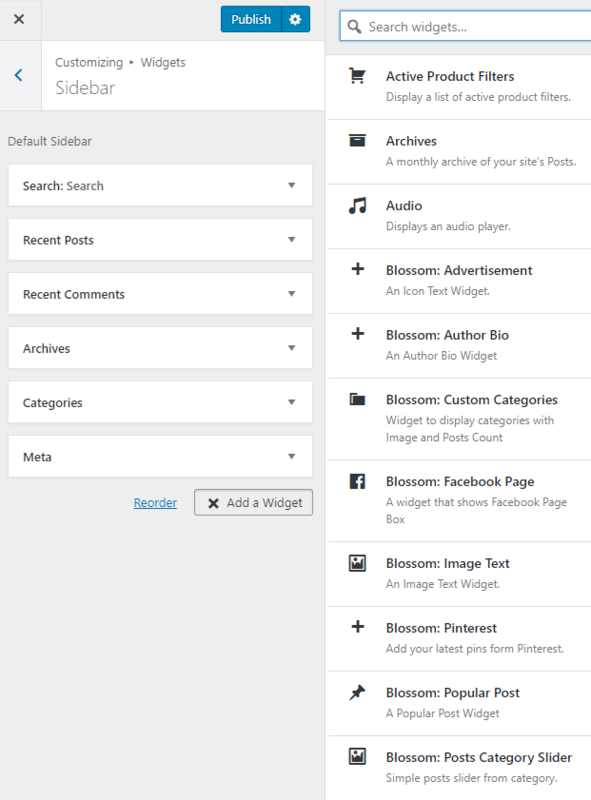 Blossom Pin Pro will work with 4.5 and above versions of WordPress. 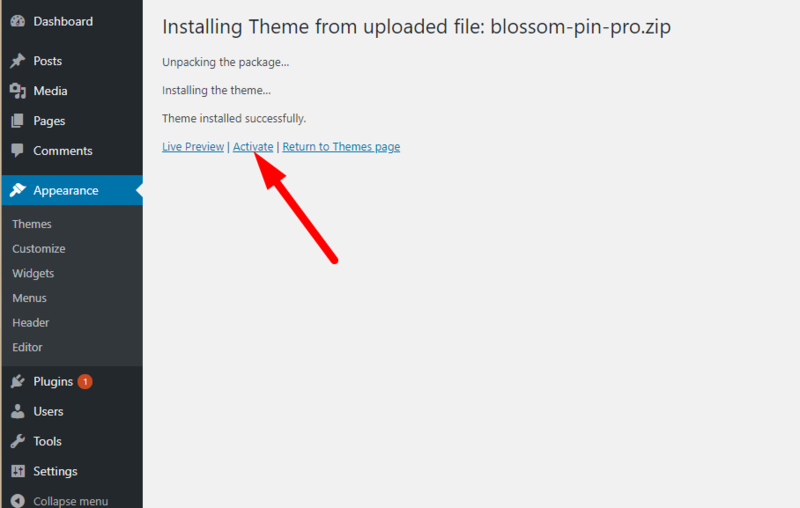 After you have the latest version of WordPress, save the downloaded Blossom Pin Pro theme file (blossom-pin-pro.zip) somewhere handy on your computer, as you will be using the included files for the rest of the installation process. 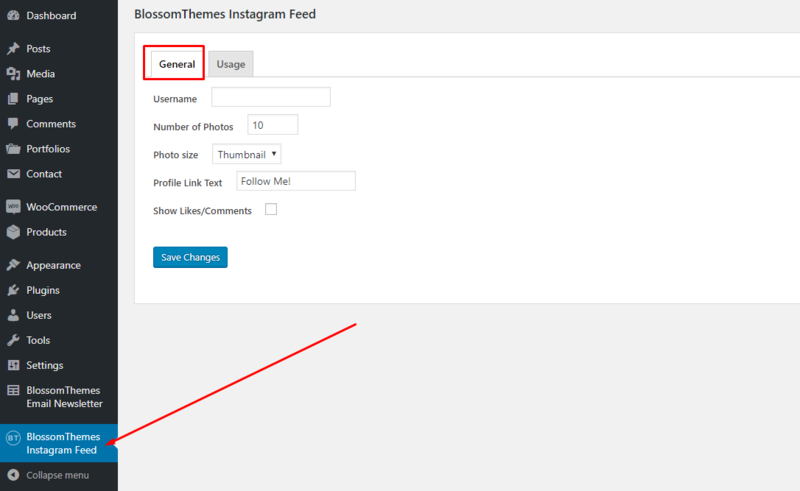 A WordPress Theme Files (in .zip format)— This (blossom-pin-pro.zip) is a compressed WordPress theme file containing all of the required templates, images, and icons required for the theme to function properly. 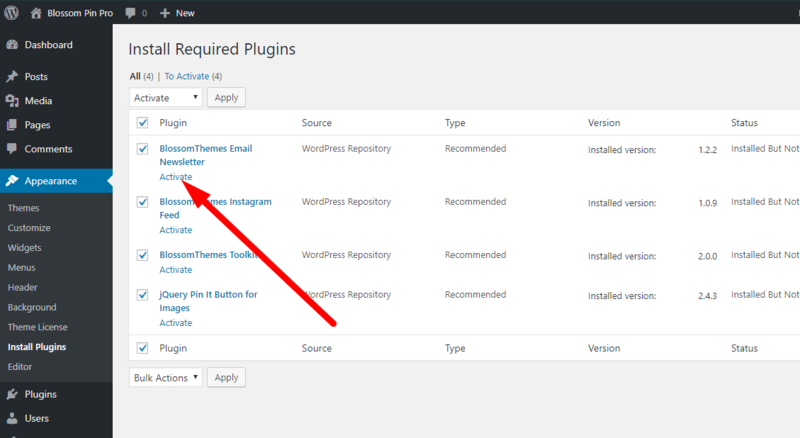 You must install and activate the following plugins to get the best out of Blossom Pin Pro theme. 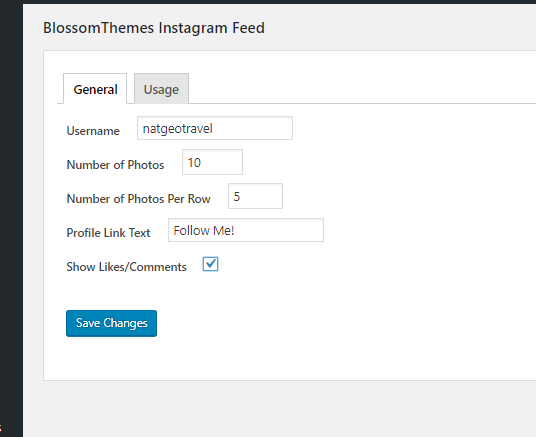 This plugin lets you add the Instagram feed to your website. 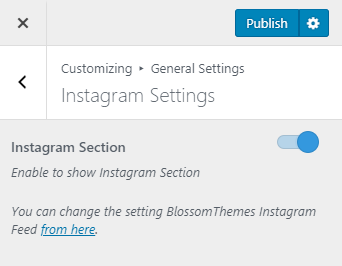 The plugin also generates Instagram shortcode that you can add in your posts and Instagram widget that you can add in the sidebars. 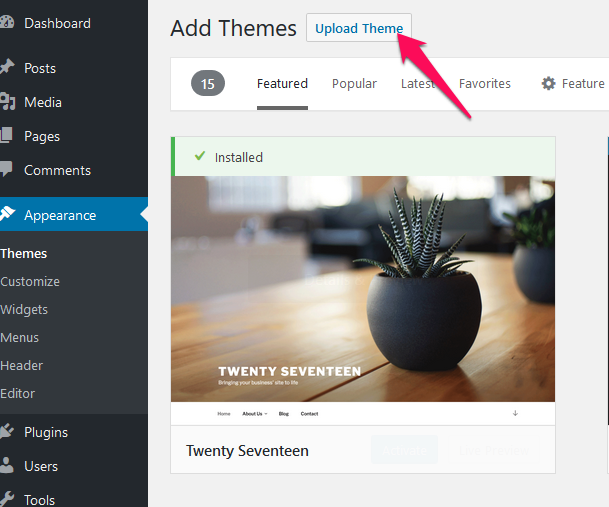 This plugin generates 12 very useful widgets for you to use. It creates widgets like popular posts, advertisement box, author bio, social media feed, etc. If you’re looking for an easy way to pin images in your blog posts and pages, this plugin will help you with that. It highlights images and adds a “Pin it” button over them once the user hovers his mouse over an image. 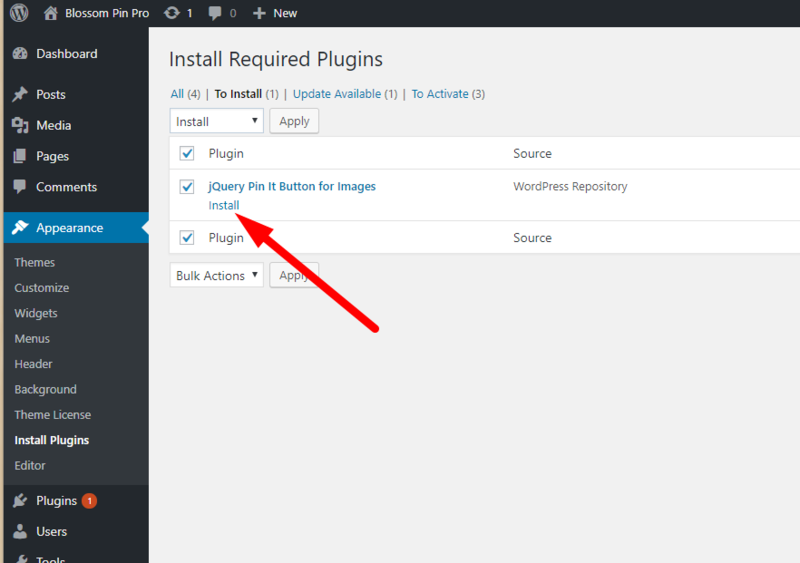 Once the user clicks the “Pin it” button, the plugin shows a pop-up window with the image and a description. 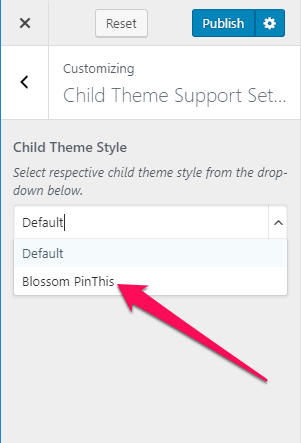 You can select the child theme layout of Blossom Pin Pro using this settings panel. 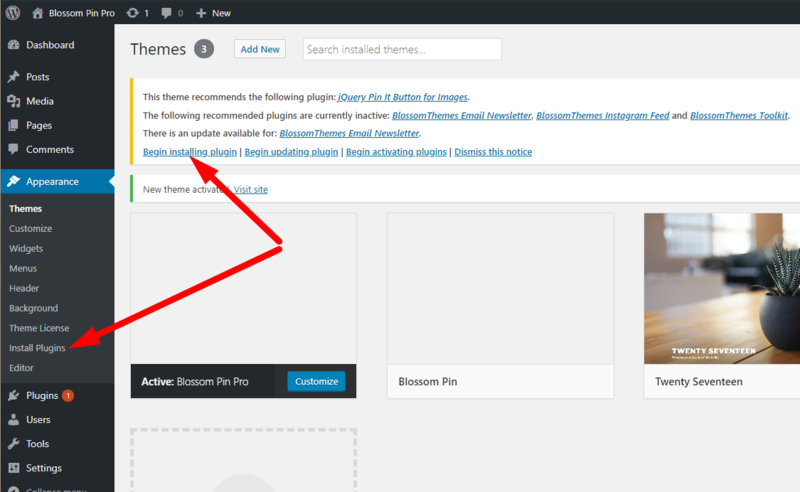 Blossom Pin Pro has a child theme Blossom PinThis whose layout you can choose for your website. Please follow the below steps to select the child theme layout for your website. 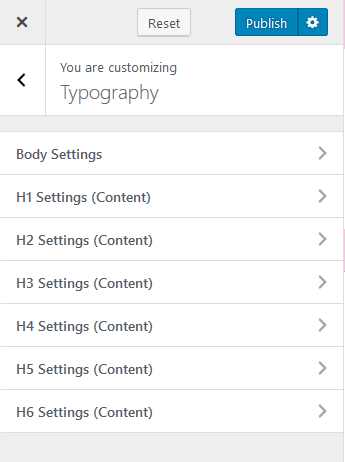 Select the child theme layout from the drop-down menu. 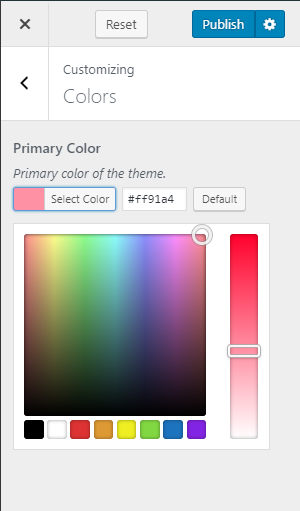 You can change the primary color of the theme from here. You can change the background color of the theme using this menu. 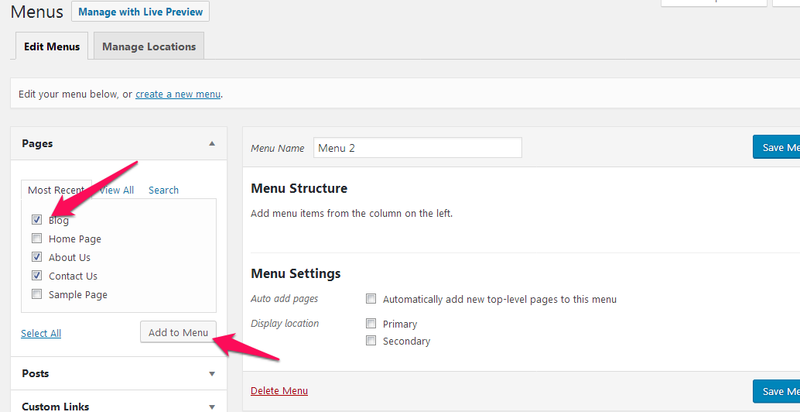 You can keep image or pattern as the background of the website with this menu. 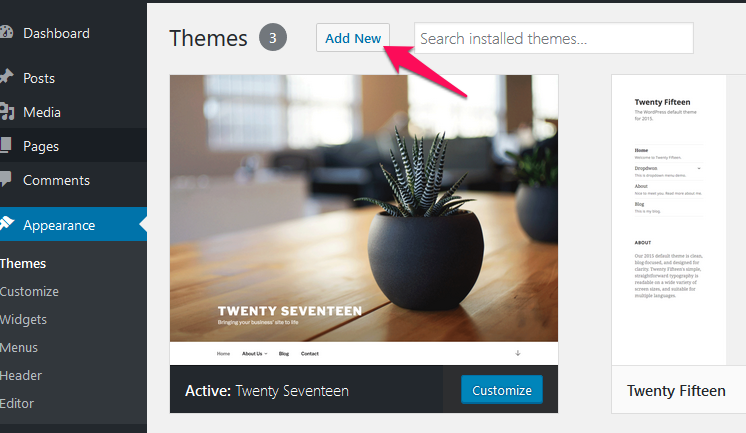 You can change the style and layout of your theme from here. 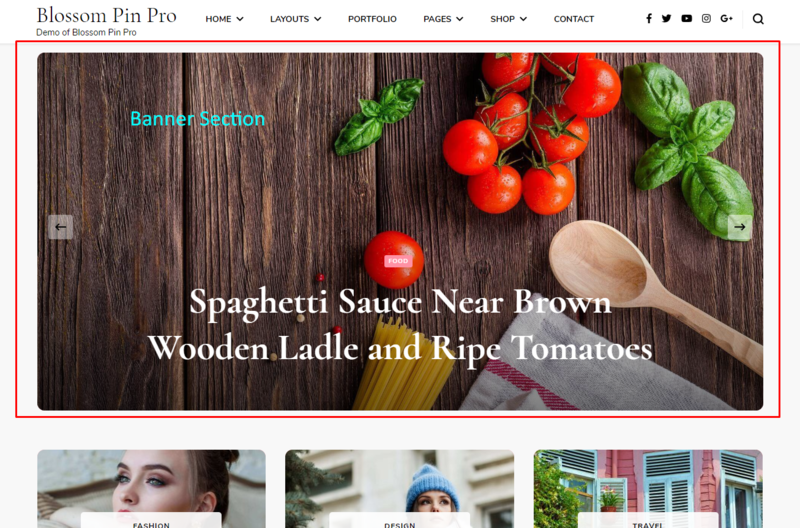 You can choose from 6 Header layouts, 8 Slider layouts,18 Home Page layout, and 6 Single Post Page layout. 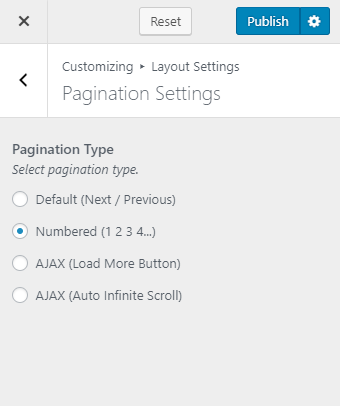 You can also choose from 4 different pagination styles. Choose the layout you like the most. If you want to show the banner ad, choose layout no. 7. Choose the style you want to use for the home page. The home page layout starts after the sticky post section if there is a sticky post. Otherwise, it starts after the featured area. 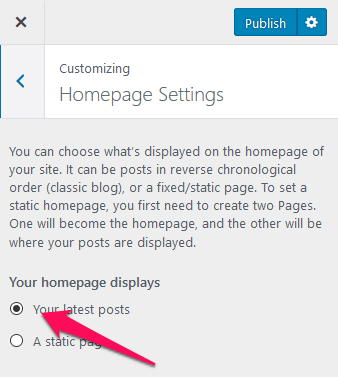 Please follow the below steps to select the Archive Page Layout. 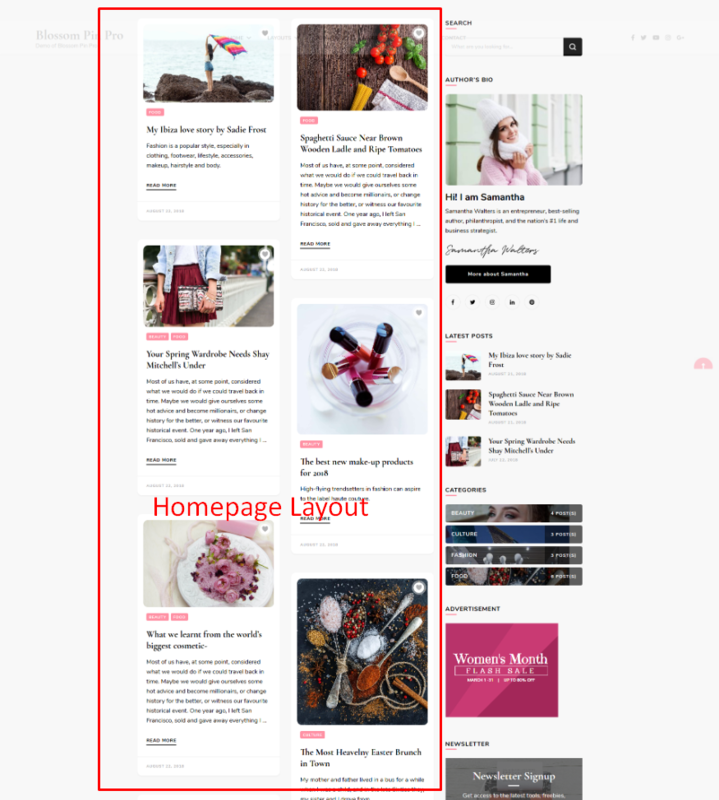 Choose the style you want to use on the post page. 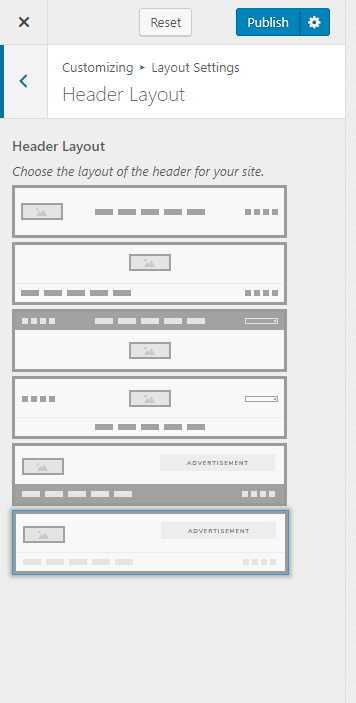 If you are not using the right sidebar on the posts, the style will adapt accordingly. 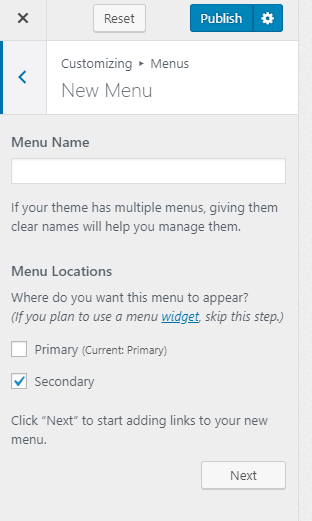 You can set the sidebar of the website with this menu. 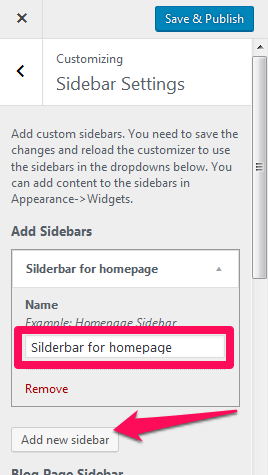 You can have different sidebars for a page, post page and default sidebar for the entire website. 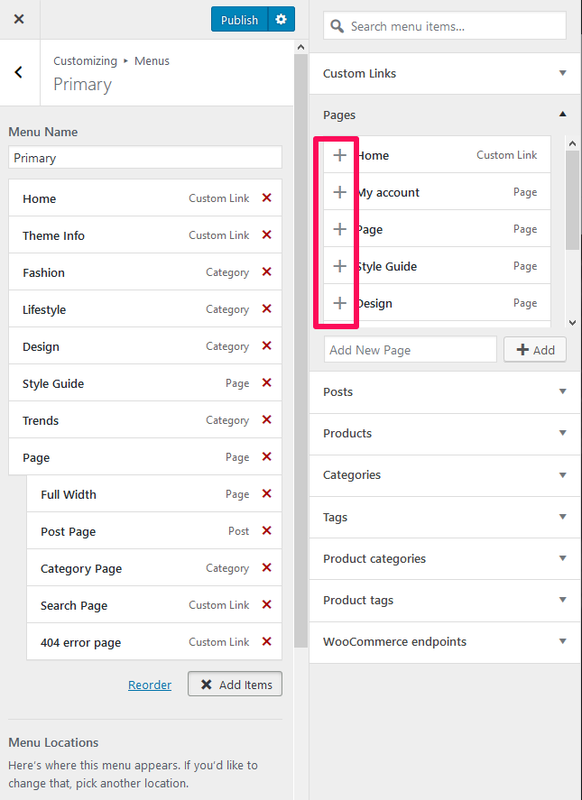 You can change the Pagination type from this menu. 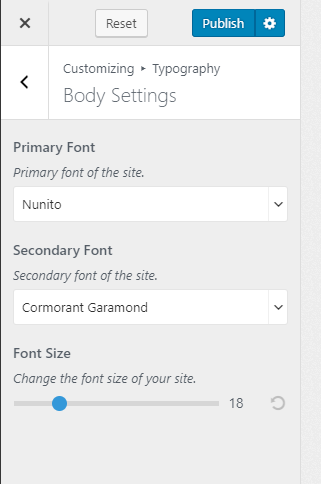 You can change the fonts of your contents and Heading here. 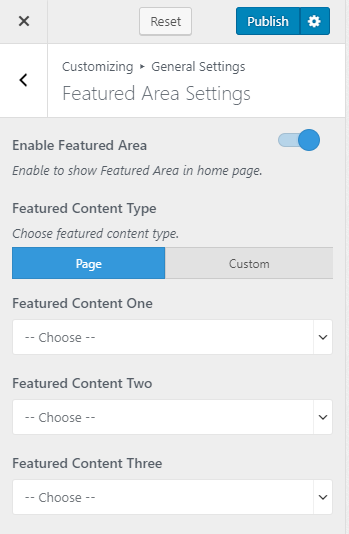 You can choose slider contents from the latest posts, categories, pages and even display the custom sliders in the banner section. Select Slider Content as Latest Posts. Choose the Number of Slides you want to display. Enable Slider Auto to have the slider auto transition. Enable the Slider Loop to display the slider content in the loop. Enable the Full Image option to display full-size image in the slider. Enable the Slider Loop to display the slider content in loop. Enable the Full Image option to display full size image in the slider. Enable the Full Image option to display the full-size image in the slider. Select/Upload the Video or the link of the video or the Header image of your choice. If you select a video, the image will not be displayed. You can Select Disable Banner Section to hide the banner section. Enable Social Links. Blue is enabled. When you enable the social links, social media icons will be displayed in the header as well as on the newsletter section. 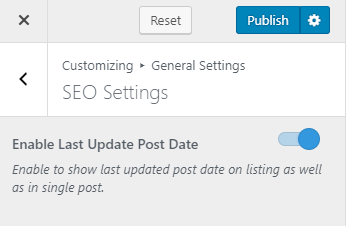 You can add social sharing buttons on the post page and archive page. You can add Facebook, Twitter, Pinterest, Google Plus, LinkedIn, Email, Reddit and other popular social media. You can change various settings from this menu. 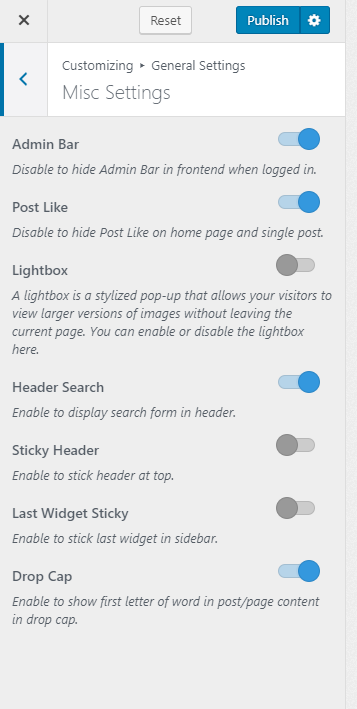 Enable/Disable the Lightbox (Pop-up that allows the visitors to view larger images without leaving the current page). Blue is Enabled. Enable/Disable the last sticky Widget in the sidebar (Blue is Enabled). Enabling the sticky sidebar widget will show the last widget while you scroll. Enable/Disable the first letter in the post/page in a Drop cap (Blue is Enabled). Disabling the drop cap will make the first letter of post/page small in size. Select Sidebars for various Pages, like Homepage, Single page, Single post page, archive page, category page, tag archive page, date archive page, author archive page, search page, etc. 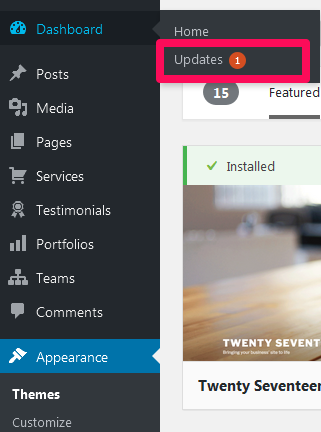 The sidebar selected under the particular pages will only be displayed on the page. 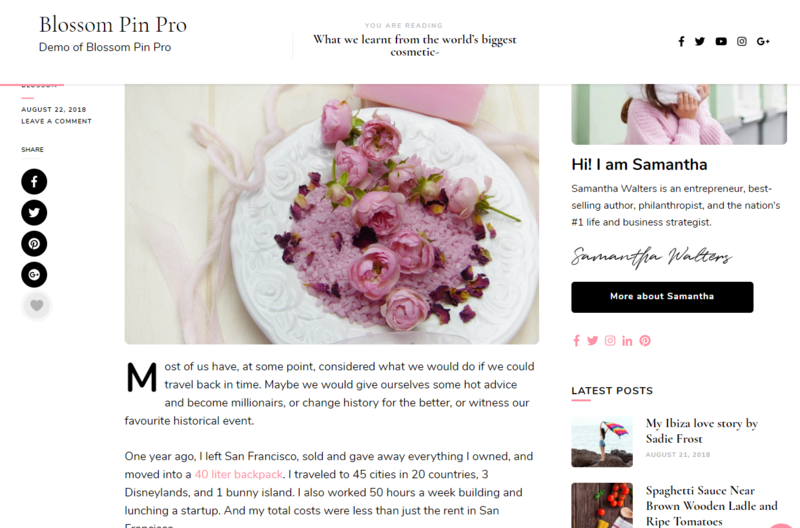 For example, Blog Page Sidebar appears only on the blog page. 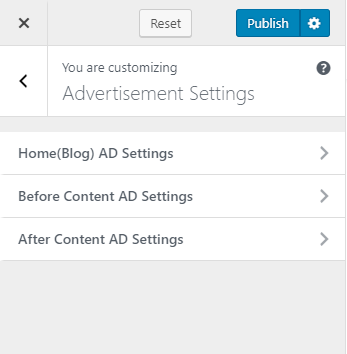 You can place ads at Google Adsense Optimized spots in Blossom Feminine Pro theme. You can place ads on 4 spots. 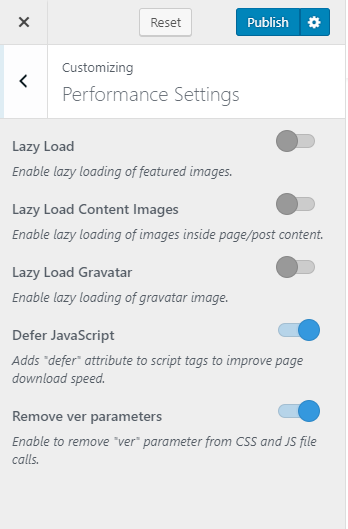 Enable Lazy Load Gravatar image. 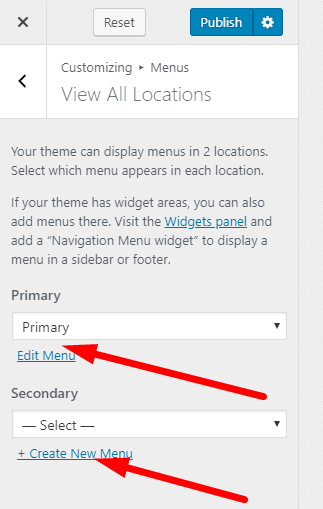 Give a name to your menu and select whether you want to display the menu on Primary or Secondary location. If you select a primary location, the menu will be displayed below the logo. If you select the secondary location, the menu will be displayed above the logo. The theme allows you to add your own desired credit or copyright text in the footer area of the page. 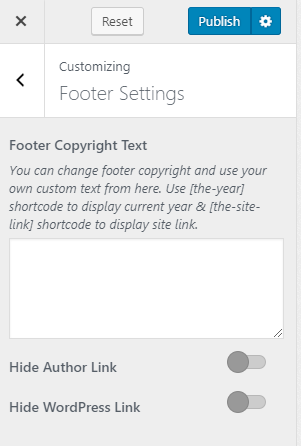 To do this, go to Appearance > Customize > Footer Settings and enter your text in the provided space. Click Publish when satisfied. 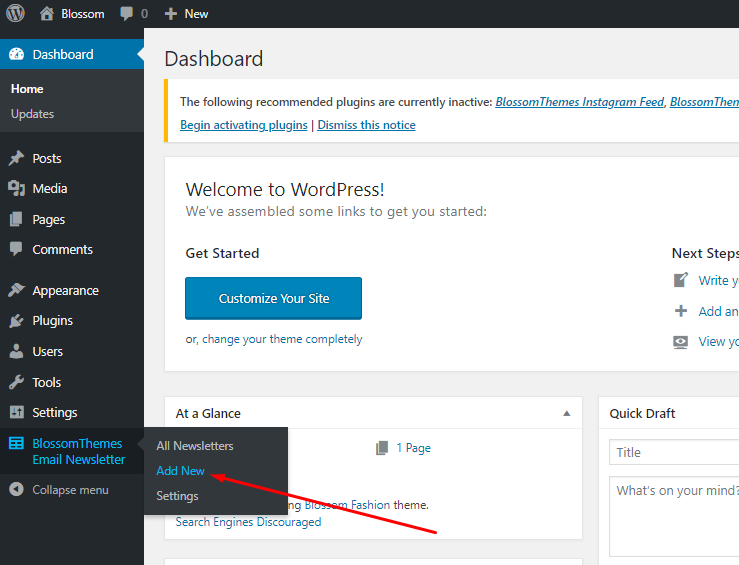 You can Enable Hide Author and WordPress Link to hide author and WordPress link.